Shopping for a new Audi Q8? Audi’s nothing if predictable: The Q8 Premium Plus trim level is the Goldilocks for content, comfort, and relative price. Most Audi vehicles are packaged the same way. 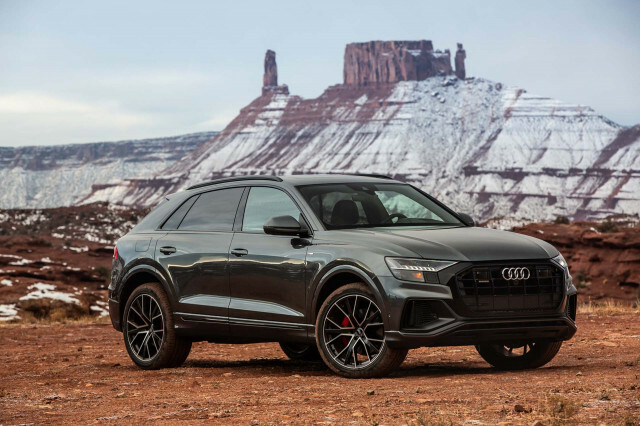 Perched atop the brand’s mountain of luxury crossovers, the 2019 Audi Q8 took the long way. We didn’t mind the ride. With the Q8, Audi went in a different direction for its luxury flagship crossover SUV. First, it skips the on-trend racy roofline that deeply cuts into available head room. The Audi Q8 also doesn’t pack a fire-breathing V-8 under its hood, or trick out with a holodeck infotainment system complete with “Minority Report” gesture controls. Our preference for the Q8 bends toward the baser of the trim levels, which are Premium, Premium Plus, and Prestige. The Q8 Premium starts at more than $68,000 but feels hardly spartan: 20-inch wheels, leather seats, a 10.1-inch touchscreen for infotainment, an 8.6-inch touchscreen for climate and vehicle controls, a 12.3-inch digital instrument cluster, panoramic sunroof, and real wood trim. Prestige models heap on matrix headlights, a head-up display, driver-assistance features, and leather dashboard, but keep the same powertrain. That engine is a turbocharged 3.0-liter V-6 that’s common among many Audi cars and crossovers. In the Q8, it’s teamed with an 8-speed automatic and a full-time all-wheel-drive system that’s capable and time-tested, but not necessarily efficient. The Q8 gets a 48-volt power system that cuts the engine at stop lights for better mileage, but the 19-mpg combined rating from the feds is lower among competitors. The Q8 steers toward comfort, rather than outright performance, anyway. The standard steel suspension is supplemented with adaptive dampers that tame the big rolling 20-inch wheels (although available 21- and 22-inch wheels spoil it somewhat) for a supremely comfortable ride. An optional air suspension goes further, can raise or lower the Q8 by fractions of an inch, and adds rear-wheel steering for better maneuverability around parking lots—the Audi’s natural habitat. Even though the Q8 sprints up to 60 mph in less than six seconds, the more important figure is the crossover’s prodigious 5,000-pound weight. It’s the first cue that Audi has built the Q8 for comfort, not speed. Four people will fit inside the Q8 with ease. Five are fine, too. If we’re driving, we’ll take the optional in-seat massagers that can be heated or cooled, with plenty of stretch out room up front with a good view. We wouldn’t mind a chauffeured ride, either. The Q8 gets more leg room in the second row, compared to the Q7, and the outboard seats are bigger for wider, adult bottoms. The Q8 is equipped with good standard safety features such as automatic emergency braking and first responder notification. Solid spend-up safety extras include blind-spot monitors, active lane control, and adaptive cruise control that can make long-distance drives or daily commutes in traffic a relative snap. The Q8 heaps on available luxury features such as a concert-grade sound system, designer interior, 22-inch wheels, and Valcona leather. Sign us up for the last one, which adds dual-pane glass that hushes the outside world like sound-canceling headphones. We have a philosophical point of order for the 2019 Audi Q8: We’d probably call it the Audi Q7 Sportback. That’s because the Q8 takes the shape of the related Audi Q7 and sculpts a racier rear-end (but not roofline) on it. Time spent pondering the Q8’s exterior isn’t time wasted, though. The Q8’s wide front and imposing nose are singularly interesting among Audi crossovers—the Q5/Q7/Q3 can be a little dull. Along the sides, the Q8 diverges from the Q7 most noticeably in the chunkier body sides and roof pillars, big wheel arches, and even bigger doors. Inside, the Q8 bathes passengers in beautiful ambient LED lights that can be customized, and Audi treats rumps to soft leathers in all crossovers. The large touchscreen controls disappear into the piano black trim, which is good and bad; we like that the screens aren’t obnoxious add-ons that will date the Q8 in 10 years, but we don’t like acres of piano black. Our favorite detail: Audi offers a trim package on the Q8 Prestige that offers an interior color combo that is handpicked by the car’s designers. Brown leather, silver headliner, gray leather dashboard. It’s beautiful—and $6,000 extra. Take the long way in the 2019 Audi Q8. Performance in the 2019 Audi Q8 is relative. Its colossal weight (more than 5,000 pounds) and orientation toward a mile-chewing, long-legged crossover steers it toward comfort rather than outright speed. Like many other Audi sedans and crossovers, the Q8 is powered by a 3.0-liter turbocharged V-6 that makes 335 horsepower and 369 pound-feet of torque. It’s mated exclusively to an 8-speed automatic transmission and all-wheel drive. Instead of feeling rushed, the Q8’s power comes on progressively and triple digits won’t be a chore—nor will they be dramatic. The standard all-wheel-drive system in the Q8 is a good one, and has been Audi’s calling card for decades. Unlike other disconnecting systems in smaller sedans or crossovers (which Audi calls “Quattro Ultra”) the Q8 gets a full-time, all-wheel-drive setup that normally sends 60 percent of the engine’s power to the rear wheels, 40 percent to the front. That power can shuttle back to front nominally to 70 percent up front, or 80 percent toward the rear for better grip or performance. The Q8 feels surefooted on loose surfaces, despite its weight, and the system is wholly unobtrusive. It’s also less efficient: The EPA rates the Q8’s highway efficiency at 22 mpg, which is relatively low. The Q8’s steering is similarly geared toward comfort; it’s more relaxed than Sunday afternoons. We’ll save our superlatives for the suspension—with (an alliterative and) supplemental spoiler. The Q8 is equipped as standard with an adaptive steel suspension that toggles between comfort and sport, but both setups lean heavily toward comfort. Despite its tall ride, the Q8 doesn’t tip around in corners and its standard front and rear five-link suspension swallow any road imperfections. Having a large family is its own reward. For the rest of us, we’ll take comfort in the 2019 Audi Q8’s spacious accommodations for four or five. Did the kids finally fall off the payroll? The 2019 Audi Q8 will help you celebrate. Unlike the related Q7, the Q8 skips the third row in favor of a slightly more stylish roofline and more comfortable second row. You’d expect the virtual king of Audi’s crossover hill to be luxurious, comfortable, and quiet. Good news: The Q8 is all three. Like the Q7, the Q8 rides atop a wheelbase that measures 117.9 inches from hub to hub, but the Q8 chops three inches from the overall length compared to the Q7. The standard leather seats are all-day comfortable, spacious, and accommodating to most body types. Long torsos, a tall seating position, and a deeply cut headliner to make room for a standard sunroof may sound like a recipe for a strained neck, but our 6-foot-3 editor had head room to spare up front. Top trims will get standard heated, cooled, and massaging front seats, which are lovely features to offset commute-induced backaches during weekdays. We’d spend our weekends in the back seats however. Compared to the Q7, the Q8 has about two inches more for leg room (more than 40 inches) and the rear seats slide fore and aft up to four inches for more cargo room. Unlike Audi’s sedans, the Q8 doesn’t have a high-rising center tunnel that makes riding hump even more challenging. The outboard rear seats in the Q8 are bigger than the Q7—one’s better suited for family duty, the other is clearly steered toward being comfortable for adults. The Q8 swallows more than 30 cubic feet of gear inside its spacious rear hatch. The second row tumbles down to double up on that capacity—more than 60 cubes behind the first row. When equipped with an optional air suspension, a button in the cargo area can make the Q8 “kneel” to make loading and unloading easier. Regardless of trim level, the Q8’s seats, dash, and headliners are shod with high-quality materials and soft leather hides. Prestige-trimmed Q8s go further with a leather dashboard and touch-sensitive buttons that are a beautiful perk inside. The 2019 Audi Q8 is a Top Safety Pick in the eyes of the IIHS and a five-star crossover SUV according to the NHTSA. 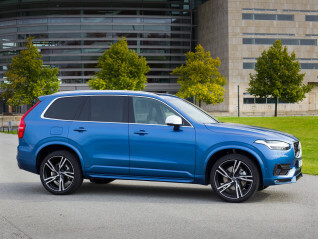 The Q8 includes standard driver and passenger airbags and stability control systems, a stiff structure and a limited trial to telematics services that can notify first responders if the vehicle has been in a serious crash. Like other Audis, the Q8 offers optional rear side impact airbags—something that probably should be standard in luxury vehicles by now. The Q8 gets Audi’s automatic emergency braking that can prevent or mitigate forward crashes up to 52 mph. Optional, extra-cost safety packages can add adaptive cruise control, active lane control, traffic sign recognition, and blind-spot monitors. Audi’s driver-assistance features can help pilot the car for long distances or in stop-and-go traffic for up to a minute without driver input, but are not a handsfree system. Unlike similar systems from other automakers, if the Q8 doesn’t detect driver input, it can slow the car in its lane, turn on hazard flashers, and notify first-responders that there may have been a medical emergency. The shorter version: Keep your hands on the wheel if you don’t want other people to think you’re having a heart attack. The Q8’s fat rear pillars makes outward vision a challenge in the driver’s blind spots. The high seating position affords good vision from the front, though. Stuffed with tech, the 2019 Audi Q8 is impressive and graceful—a rare feat nowadays. At the figurative top of the Audi crossover range, the Q8’s menu of standard and optional items is impressive. This year, the 2019 Audi Q8 is offered in Premium, Premium Plus, and Prestige trims and costs $68,395 to start. Base cars don’t skimp on the good stuff either. 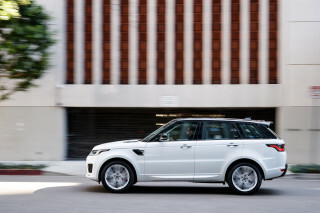 Every Q8 is equipped with at least 20-inch wheels, a 12.3-inch digital instrument cluster, a 10.1-inch touchscreen for infotainment with Apple CarPlay and Android Auto compatibility, an 8.6-inch touchscreen for vehicle functions and climate controls, Bluetooth and USB connectivity, panoramic sunroof, and active safety features we cover above. Optional equipment ranges from performance add-ons to driver-assistance technology, upgraded audio, and bigger wheels, but most spend-up extras are bundled into pricier trim levels or large packages that add thousands to the bottom line. Top-trimmed Q8 Prestige models cost more than $77,000 and add advanced matrix headlights, a head-up display, leather dashboard, 21-inch wheels, premium audio, a surround-view camera system, four-zone climate control, and a driver assistance package that’s optional on other levels. A first-year package for the Q8 adds black exterior trim pieces, 22-inch wheels, red brake calipers, and other small appearance options for $2,650. Skip it, we’d say, and opt instead for a driver assistance package (standard on Prestige, optional on Premium Plus) that adds for $2,750 active lane control, adaptive cruise control, and traffic sign recognition. In some cities, a transponder in the car communicates with traffic lights to show drivers on the instrument cluster how long they’ll be stopped at an intersection. An adaptive air suspension is available and bundled with rear-wheel steering to make the Audi Q8 more comfortable and maneuverable at slow speeds. It costs $2,750 and is optional at every trim level. Like the A6, A7, A8, and E-tron, the Q8 receives Audi’s latest infotainment system, dubbed MMI. The system uses upper and lower touchscreens for infotainment and vehicle controls, and most versions are paired with a 12.3-inch digital instrument screen, which is standard on the Q8. The Q8’s 10.1-inch touchscreen for infotainment is crisp and responsive, easily navigable with clear menus and standard navigation. The Q8 can use cellular data to download satellite images for the maps and curated lists for nearby restaurants from Yelp. Apple CarPlay and Android Auto can run wirelessly on the new Audi system, too. When placed on the wireless smartphone charger underneath the center armrest, the Q8 boosts the phone’s signal and offers a safe, and smart, way to use a smartphone in the car. 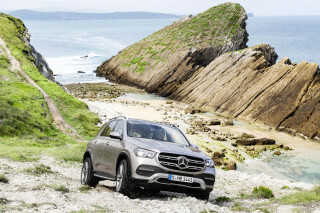 Compared to luxury rivals, the Audi system is similarly impressive and responsive, but lacks the dead-simple intuitive menu system of Tesla’s infotainment software and the baked-in internet connectivity of Mercedes-Benz MBUX infotainment. The 2019 Audi Q8 isn’t very fuel-efficient, but it is consistent. 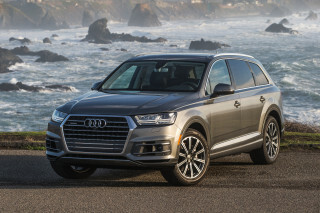 Hybrid batteries or plug-in powertrains skip the big Audi crossover in its first year on sale. What’s left isn’t very fuel-efficient. That’s mostly expected for a full-size crossover that weighs more than 5,000 pounds, but some of the Q8’s competitors do better. 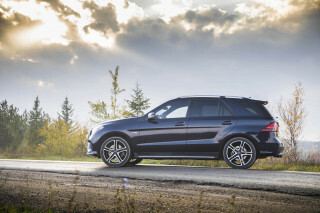 The Mercedes-Benz GLE Class hasn’t been rated by the EPA, but we’ve managed highway mileage in the mid- to high-20s. 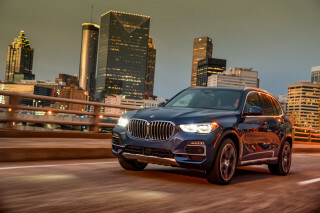 The 2019 BMW X5 with its 6-cylinder rates 20/26/22 mpg, according to the EPA. In our testing, the Q8 consistently returned 22-23 mpg on long highway drives over hundreds of miles. Looking for a different year of the Audi Q8?